Hello guys, this time i wanna share about BROTLI. What is brotli?, Why Brotli?, Comparison and how to build the packages. Let's begin with what brotli is. BROTLI is a new compression algorithm that compresses data using a combination of a modern variant of the LZ77 algorithm + Huffman algorithms. abcdeabcdf can be compressed with LZ77 to abcde<4,5>f and aaaaaaaaaa can be compressed to simply a<9, 1>. Huffman : Bit Conversion. I will not discuss this in depth but if you want to, take a look on this brotli-ietf. The smaller compressed size allows for better space utilization and faster page loads. As the smaller compressed size would give additional benefits to mobile users, such as lower data transfer fees and reduced battery use. Compressed content takes less time to transfer and reduces load times. 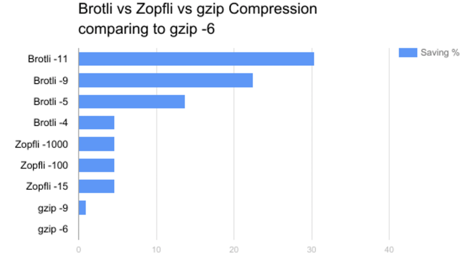 Brotli comes with 0 to 9 levels of compression. Brotli compression not yet supported by all varian of web browser, so make sure you have a "PLAN B" compression such as gzip. I'm using Centos 7 when i build the package. - Download nginx package using wget. Pull ngx_brotli module using git and update the module. - Decompress nginx package and configure nginx to include the ngx_brotli module. After that make the installment. - Configure nginx.conf file to enable brotli module, in my case i enabled the gzip algorithm too, because in case the browser not support with brotli it will redirect the algorithm to gzip. This is the result sample when brotli compression implemented with nginx server.